We cordially invite you to the presentation of our new book, Judaism in Opera. 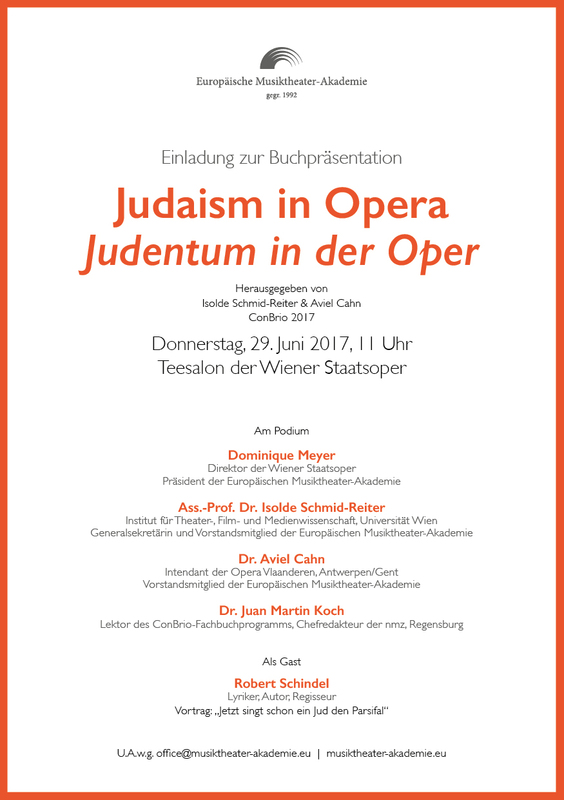 Judentum in der Oper, on 29 Juni 2017, 11 am. On the podium of Vienna State Opera’s Teesalon, the Director of the State Opera, Dominique Meyer, and the editors of the book, Isolde Schmid-Reiter (University of Vienna) and Aviel Cahn (Opera Vlaanderen, Ghent/Antwerp) will introduce this latest volume in the series Schriften der Europäischen Musiktheater-Akademie, and the author Robert Schindel will give a guest talk titled “Jetzt singt schon ein Jud den Parsifal”.